After Calderstones we went to Nic Corke’s gallery on Aigburth road where there is a fine selection of works by street artists. Banksy, of course, is probably the best known but the others are mostly established artists too and there’s a lot of interesting work. There’s some 3D work as well and I like the way a lot of the prints have been framed in cardboard! This week is Part 1, next week some but not all of the pictures will be replaced with new ones. This is the largest exhibition of limited edition and original ‘outsider’ art to be exhibited in a gallery in the North West of England. 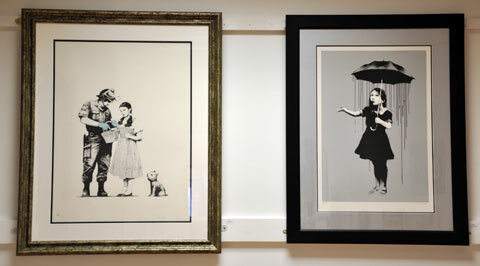 No other artist showing in the 2010 Liverpool Biennial has captured the imagination or attention of the public like Banksy and the Corke Art Gallery is the only venue in Liverpool to be exhibiting so many of his famous images along with the work of 44 other artists whose work is striking and thought provoking. 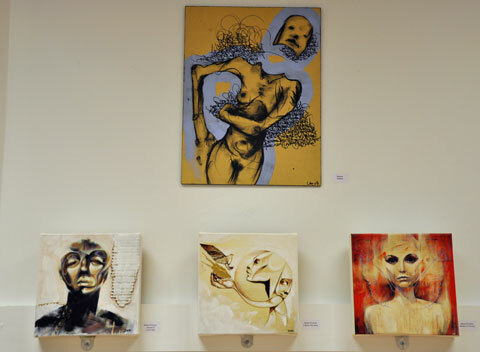 Exhibition of work by leading international street artists including 3D, Alex Corina, Antony Micallef, Banksy, Bast, Bestie, Beejoir, Conor Harrington, Cyclops, D*Face, Dale Grimshaw, Dave Choe, DOC, Dolk, Eelus, Faile, Handiedan, Herakut, Hush, I-Lib, i-Rat, Invader, Jamie Hewlett, Jamie Reid, Jeremy Geddes, Joe Black, Josh Keyes, Judith Supine, Julian Kimmings,Ken Bullock, K Guy, Kaws, Know Hope, Mau Mau, Miss Bugs, Mighty Mo, Mr Brainwash, Nick Walker, Paul Insect, Replete, Sam3, Shepard Fairey, SPQR, The London Police, Word To Mother.